Collection from the local train station and back. All meals accomodation, (same as above) transport to and from local train station, 4 days dog training tuition(your dog or mine) and your laundry done too!! DOG TRAINING COURSE IS TAILORED TO YOUR LEVEL, AND WILL START WITH THE BASICS AND WORK UP TO TRIALS STANDARDS ENDING WITH DRIVING THE SHEEP THROUGH A COURSE. !. Locally grown lamb and Highland beef a specialty. The tasties beef youll ever taste!! Try working one of our sheepdogs ! Or take a training lesson with your own dog! Also, tents, sleeping bags available if needed. Sorry but we are closed for renovations untill further notice! 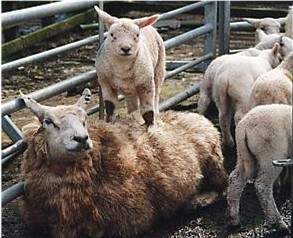 Owners are responsible for any damage casued by their dog to any sheep. Please note, this training is for sheep dogs only. Not crosses, which might try and kill sheep instead of work them!. please call 01631 730 232 for b and b at my mother in laws farm along the road. if still interetsed in b and b.